I have always been intrigued by the little things in life and all the wonderful details that makes life so interesting! I carry that with me when creating my artwork.. I love offering lots of fun places for the viewer to "get lost" in! I also infuse all my artwork with inspirational and positive messages, on all levels. It is very important for me to create something that hopefully provides comfort and joy to others as well! 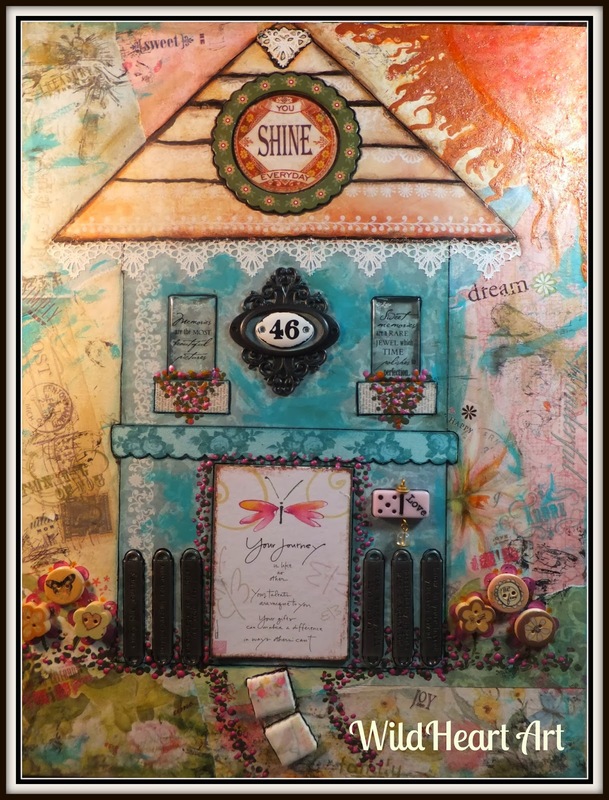 I love whimsy and here I have decided to create one of my sweet little houses for this weeks Sin City Stamps Design team post featuring Frog Dog Studio~ Enjoy!! 1)Start by tearing and collaging the papers onto the canvas and gluing down with collage glue. Paste down a rectangle shape for the house. 2) I then added texture with the Sin City Pam Bray Dragonfly stamping randomly and not always completely... just wanting to add a bit of fun texture as seen below . 3) Add a sun in the right corner using the copper acrylic ink and "fanning" outwards. 4) I then cut and added a triangle for the roof and started with some of the small details such as trim work and the front door. 5) Here you can see I have added in more details such as fence posts, wooden flowers, domino charm, tiles for the pathway ect. 6) I added highlighting to the house with the Big Brush markers. 8) Adding more details of greenery and flowers around the door and down the pathway. 9) here you can see the detailed flowers created with the wooden buttons along with the domino charm from Frog Dog Studio. I just adore creating these sweet little houses and adding all this great detail to make your eyes wander and your heart sing with inspiration and affirmation! I hope you have enjoyed creating your sweet little house and thanks for joining me! I will also be offering full workshops on creating these wonderful little houses this spring so check out my website for more details shortly! Great Job Sherri! Thanks for sharing! Loving this house! So adorable! Is it a Tag or a Card?